The focus of my blog is to review book series and not individual novels, but writers are going to continue writing novels within a series even after I have done my review, so I plan on reviewing the individual novels as they come into circulation. 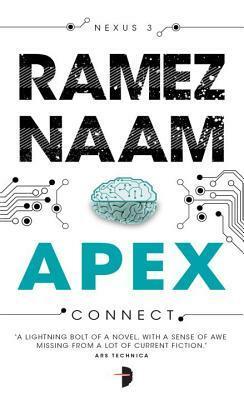 Ramez Naam just recently added book #3, Apex, to the Nexus series. Ramez Naam’s Apex is the third addition to Naam’s Nexus series and the ending to what has been an exciting trilogy. Naam’s Nexus is a nano-drug that creates the ability for mind-to-mind communication between individuals that harbor the Nexus nanoparticles in their brains. In the Nexus world, humans not only have the ability to communicate verbally to others through their thoughts, but also share their emotions and memories as well. Even though most of the series focuses on the usage of Nexus and the emergence of transhumans, humans that are part human-part technology, and the effect that is has on the human population, Apex focuses more on the emergence of posthumans, humans that evolve into a totally technological life form. The posthuman in this case is Shu-Yong Shu, a neuroscientist that suffered from a catastrophic event that left her on the verge of death, whose memories were computerized and downloaded and transferred into a living clone of herself. The clone was hunted down and killed earlier in the series but the essence of what was Shu-Yong Shu was trapped within a server that was inaccessible to the outside world. In her isolation, not unlike prisoners in solidarity confinement, Shu-Yong’s thoughts and feelings turned toward insanity. It is the insane Shu-Yong Shu that becomes the focus in Apex. Naam’s Nexus series has a feeling of a science fiction thrill ride; however, the basis of the series also has roots in what may be humanities’ eventual reality. Nanotechnology and nano-drugs are emerging technologies that already have an impact on our lives with nano-drugs Abraxane and Doxil being readily used for treatment for specific cancers. Mind-to-mind communication experiments are in the works with presumably a recent success of a rudimentary brain-to-brain communication experiment completed by an international team of scientists that were able to have two individuals communicate mentally that were physically separated 5000 miles from each other. Some scientists are concerned on what is called the ‘Singularity’, when technology surpasses human intelligence which could lead to dire effects on the human race. Naam’s Apex stresses that possibility through Shu-Yong Shu’s repression which leads to her insanity and her retaliation. Though some believe that the Singularity may occur within our life time, others including Naam himself believe it will be many years before we need to be concerned about the Singularity happening. The Nexus series along with Apex is a fun series and I highly recommend. My only complaint about Apex was that it was a bit too long and dragged on a bit which took away some of the thrill from the ending. Be sure to read the appendix, as Naam gives a very informative review of the latest technology and its relation to his fictional works. Though this is the end to the trilogy, Naam has left a ‘back door’ open for a possible continuation of the series. As a trilogy, the series must be read in order. To learn more about the series check out Ramez Naam’s Nexus Series. Posted in Technothriller.Tagged Book Review, Book Review Blog, Book Series, books, nexus, ramez naam, singularity, Technothriller, Thriller.